Somehow I never read Pippi Longstocking as a child, and only faintly remember seeing previews in the ’80s for a terrible looking Pippi movie featuring a girl with fake freckles and ridiculous braids. But one of the best things about having children (I’m serious!) is you get to go back and read all those books you missed. Pippi it really is the perfect book to read to a 4 year old, especially if you read this illustrated version which had just the right amount of pictures (my 7 year old son enjoyed the book too). Pippi as a character is a little too goofy for me to fall in love with–like, say, I fell in love with Dorothy, or Lucy of the wardrobe, or Taran the assistant pig keeper–but I am totally aware that adults aren’t the ones meant to fall for Pippi anyway. My kids loved her of course. The book is charming with some seriously funny moments (such as Pippi joining in an adult conversation over coffee where ladies are complaining about their maids, and Pippi adds her own complaints about her mother’s maid, who bit guests on the leg and broke the dishes but only on Wednesdays). What haunted me throughout the book though was this early scene where Pippi explains why she must live by herself in a house called Villa Villekulla. It grounded all the craziness for me and helped explain Pippi’s self-made world of fantasy: it’s how children make sense of the world, and in fact repair their world, through the stories they tell. “Once upon a time Pippi did have a father whom she loved very much. And of course she once had a mother too, but that was so long ago that she couldn’t remember her at all. Her mother died when Pippi was a tiny little baby, lying in her cot and crying so terribly that no one could stand to come near. Pippi thought that her mother was now up in heaven, peering down at her daughter through a hole. 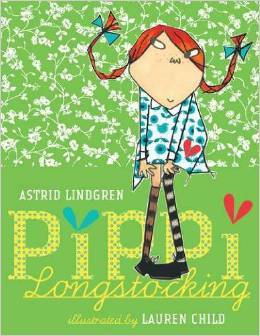 But Pippi had not forgotten her father. He was a sea captain who sailed the great seas, and Pippi had sailed with him on his ship until one day a big storm blew him overboard and he disappeared. But Pippi was sure that one day he would come back. She didn’t believe that he had drowned. She believed that he had washed ashore on an island that was inhabited by natives and that her father had become king of them all. He walked around wearing a gold crown on his head all day long.